Engineers examining the Ringhals 1 nuclear power plant in the summer of 2003 discovered a leak in a critical pipe deep beneath the reactor core. 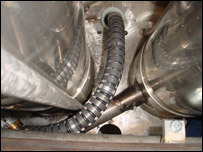 The pipe was part of the reactor's safety control rod mechanism,activated during a reactor shut-down. Left unchecked the fault could jeopardise the safe operation of the Swedish power plant or even shut it down for good. The plumbing was meant to last the lifetime of the reactor and was never intended to be repaired. Just to gain access, an engineer would have to cut a human-sized path through a tangle of pipes, dubbed "the jungle". Doing so could irreversibly damage the reactor. Increasingly, precise jobs like this, in difficult-to-reach or hazardous places, are done by robots. The army use them for bomb disposal and space agencies use them to explore distant planets. But many robots are bulky and most are relatively inflexible. To access really difficult parts, engineers must turn to a different breed of machine. 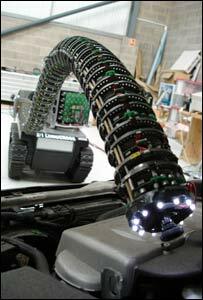 Snake-arm robots, as they are known, are lightweight, flexible manipulator arms. They look like a spinal column, made of lots of individual vertebrae, and can contort to any desired shape. One day it is hoped that their slender tentacles could be used to control intricate operations deep within the recesses of the human brain. "These robots are really about getting into awkward spaces," said Dr Rob Buckingham of OC robotics, a company that builds and develops snake-arms. "The advantage of these robots is that you get a device that can steer around multiple corners." Snake-like robot arms have been investigated by scientists for more than 30 years. But despite the best efforts of large institutions, such as Nasa, they have largely remained a laboratory curiosity and sometime niche industrial product. "There have been a number of companies that have sold a few of these robots, but the market for them has just never got big enough," said Joel Burdick, a professor of robotics at the California Institute of Technology. Companies such as Oxford Technologies in the UK have built advanced virtual-reality-controlled snake-like arms for the Joint European Torus (JET), an experimental nuclear fusion reactor in Oxfordshire. The French and Japanese nuclear industries also use them to maintain the inside of their fission reactors. But snake-like robotics have never slithered into the mainstream. OC robotics, based in Bristol, is one company hoping to change that. One of the major challenges of developing these lithe limbs is modelling and controlling their movements. Standard robotic arms have just six degrees of freedom. This allows the tip of the arm, usually where a camera or tool is located, to reach almost anywhere within arm's length. By contorting, the arm can reach up, down or to the side. This kind of simple movement is relatively easy to program and is all that is needed for most industrial applications. But in confined spaces, for example, these robots are limited. Their "elbows" cannot make the necessary movements to allow the tip to reach its destination without the whole arm becoming stuck. Snake-arm robots on the other hand can move in up to 30 different directions at once. Their supple bodies can bend and flex to fit the shape of the confining space. "There are a large number of ways that the arms can move," said Dr Buckingham, whose research appears in the Royal Academy of Engineering's Ingenia magazine. "The number of possible movements means the maths can become very interesting." OC Robotics has now developed software that can charm their snakes and allow an operator to move the tip of the arm to where it is needed. In addition, once the tool is in position the software allows the body to wriggle and change shape as required. The OC Robotic's snake-arms tend to be made of lightweight materials such as aluminium alloys. Each one is made of several segments. The more segments, the more flexible the arm. 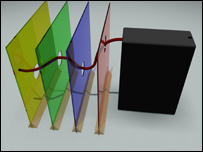 Movement is controlled by a series of wires running through the core of the arm. Three wires are connected to each segment. A series of motors, or actuators, at the base of the arm work the wires like a puppet master. By carefully controlling the length of each wire, the limb can be moved and bent into shape. The company already has contracts with the UK and US military to use the technology for bomb disposal robots. They are also working on a portable device that can be carried by soldiers or in the back of a police car to allow the first inspection of a suspicious package or vehicle. Airline manufacturer Airbus is also looking at the technology for inspecting the inside of the wings of some of their future aircraft. It would also like to use them to routinely check the inside of jet engines, cutting down on maintenance time. Others are interested in the medical applications. "The whole field of medicine is moving towards minimally invasive surgery; trying to do the least amount of damage possible during surgery," said Professor Burdick. Some surgery like this is done using a laparoscope, similar to a set of chopsticks with tools on the end. The surgeon pokes these through a tiny hole in the patient to do an operation, such as removing the gall bladder. "You can imagine that if you want that stick to be more intelligent and more manoeuvrable, you could have a snake-like stick," he said. The mechanisms of a snake-arm robot could be used in a steerable endoscope for internal examinations or for reaching deep into the brain. "There are lots of applications," said Dr Buckingham. "What this is all about is reaching the unreachable."